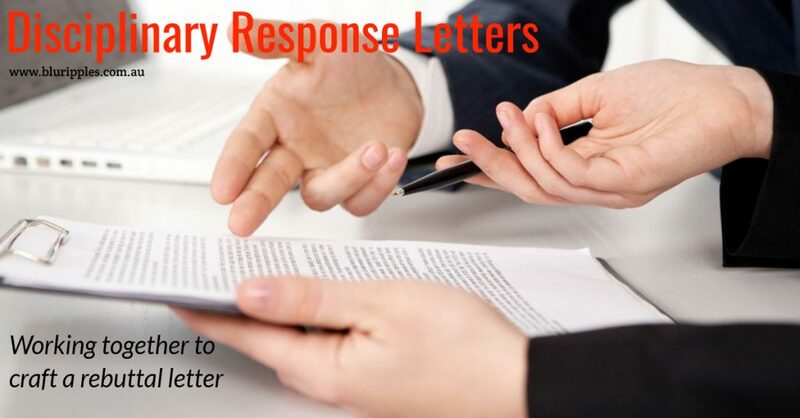 Blu Ripples Disciplinary Response Letters – Working together with you to compose a professional rebuttal to your disciplinary warning or notice. Blu Ripples Disciplinary Response Letters provide clients with objective rebuttals to disciplinary warnings and notices issued by management in a disciplinary consultation. Prior to meeting with Blu Ripples Consulting Services, it is important that you gather as much relevant information and evidentiary support as you possibly can, as quickly as you can to ensure that we can formulate, respond and submit your rebuttal letter within the designated time-frame. It is important that you gather as much relevant information and evidentiary support as quickly as possible, particularly if you have been unfairly dismissed from your employment as you will only have 21 days to lodge a claim with the Fair Work Commission after your dismissal takes effect. Blu Ripples Consulting Services constructs disciplinary response letters based on the information that you have provided to us; Blu Ripples is a Career Counselling and Consulting practice, we are not lawyers and do not provide legal advice but may refer you to your professional industry association, the Fair Work Commission, Legal Aid, Law Society of NSW or a Lawyer to help you find an appropriate legal counsel if so required. Blu Ripples is not liable for the outcome of any correspondence prepared by our practice.